In a world where an infection turns people into zombies, a dedicated father attempts to protect his infected daughter from mandatory quarantine. Quite a few years ago—1997, in fact—Sylvester Stallone attempted to change his cinematic action hero image by playing an ordinary, heavy-set, passed-his-best, half-deaf cop in James Mangold’s Cop Land. It was a brave attempt at trying a new direction, but it wasn’t too long before he was back to what he knew best in various Rambo, Rocky, and Expendables movies. 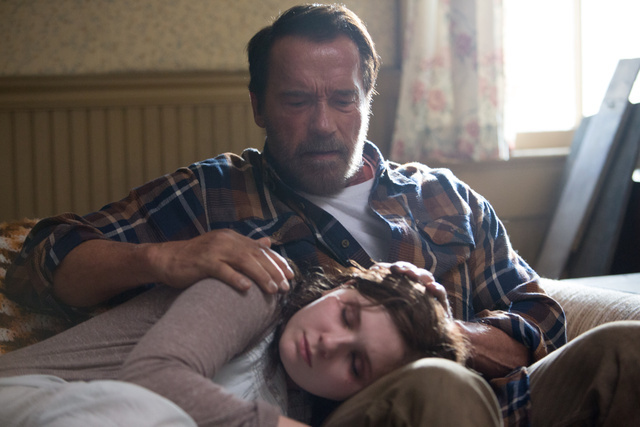 In Maggie, movie man-of-action Arnold Schwarzenegger (at age 67) is trying something similar by playing an ordinary father, not a musclebound superhero out to save the Earth. It is perhaps a switch in emphasis that’s less important in Schwarzenegger’s case as he’s already branched out in a new direction, with a successful foray into politics as the Governor of California. Also, it is much later in his career than Stallone’s, so he’s both earned the right to try something different and can take any fall out of failure. Thankfully, Maggie is not a failure. It is not exactly strikingly original, either, but there is something in seeing Arnold do ordinary mixed with Little Miss Sunshine herself, Abigail Breslin, as his infected daughter. An Arnold zombie movie suggests high octane carnage, but here there is a minimum of physical altercations and hardly any other zombies in evidence beyond the daughter. It’s a slimmed down, almost two-hander (Joely Richardson features as Schwarzenegger’s frustrated wife, she’s also in the EIFF screened The Messenger). Society hasn’t collapsed, although it is teetering on the edge. Infection is treated like any other virus outbreak, although it appears to be inevitably fatal. Quarantine until death is the official answer, but many people, Schwarzenegger’s character among them, can’t face abandoning their loved ones to such a cruel system, even knowing the dangers of infecting themsleves or others. Breslin’s metamorphosis is slow but inevitable, and the drama lies in her father’s response to it, which is quite a lot—dramatically speaking—to lay on Schwarzenegger’s ample shoulders. Thankfully he rises to the task, almost axiomatically by doing virtually nothing. He is at his best here as a still, near mute presence, whose caring for his daughter is almost beyond his ability to express: quite a change for the Austrian Oak. Put aside the zombies and this could be a movie about any kind of terminal diagnosis and how people respond to it. The end result may be predictable, but Maggie does not outstay its welcome and is a different addition to the ever-growing field of zombie movies and television shows that seem to be overwhelming popular culture at the moment.